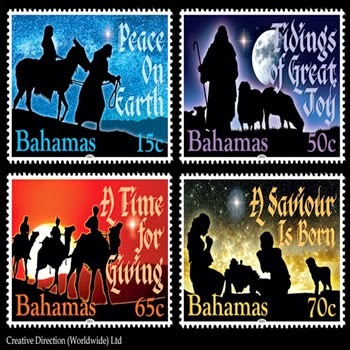 This year the Bahamas Post Office has released a set of four stampsthat concentrate on the Message of Christmas. The illustrations are portrayed with the characters of the familiar Nativity Story shown as silhouettes against brightly coloured night skies with each scene helping to emphasise the various messages on the stamps. It is believed that Saint Francis of Assisi, inspired by his visit to the birthplace of Jesus, created the first ever nativity scene in 1223. His intention was to place the emphasis on the celebration of the birth of Jesus rather than on the more secular materialism of gift giving. The Nativity was held in a cave near Greccio in Italy and was a living one with real people and animals cast in the various Biblical roles. These Pantomimes became hugely popular. Within a hundred years every church in Italy was expected to have a Nativity Scene at Christmastime and they soon spread to churches and homes throughout Christendom. 15c stamp, Peace on Earth: Mary and Joseph travel to Bethlehem. 50c stamp, Tidings of Great Joy: The angel visits the shepherds bringing “Tidings of Great Joy”, not just for the shepherds but for all people. 65c stamp, A Time for Giving: The wise men travel to Bethlehem in search of the infant Jesus with their gifts of gold, frankincense and myrrh. 70c Stamp, A Saviour is Born. The FDC, portrayed in the same style as the stamps, depicts a Nativity Scene with the wise men presenting their gifts to the infant Jesus.